I’ve been on seven flights in the past four weeks and my skin is feeling it right now! 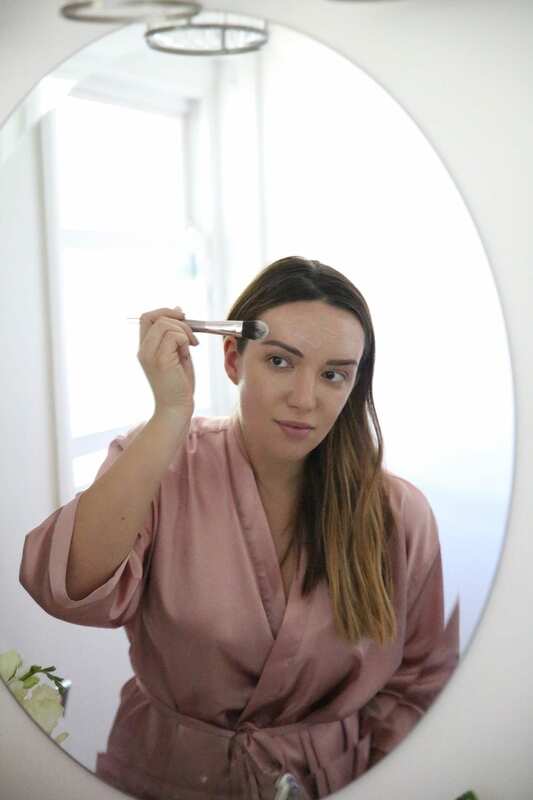 Once I had a chance to touch down at home and have a day to myself–I decided it was time for some relaxation and a bit of pampering for my skin. I just got back from a video shoot in Los Angeles and the makeup artist I was working with (she’s amazing, currently working on Shonda Rhimes shows!) commented on how my skin was a combination of dry and oily. I always knew I had combination skin but I think my exposure to dry airplane air has put my skin into overdrive lately. During the shoot she was applying moisturizing products to my dry spots and oil fighting products in different areas to keep my skin balanced and she got me thinking I was due for some multi-masking to help rebalance my skin. 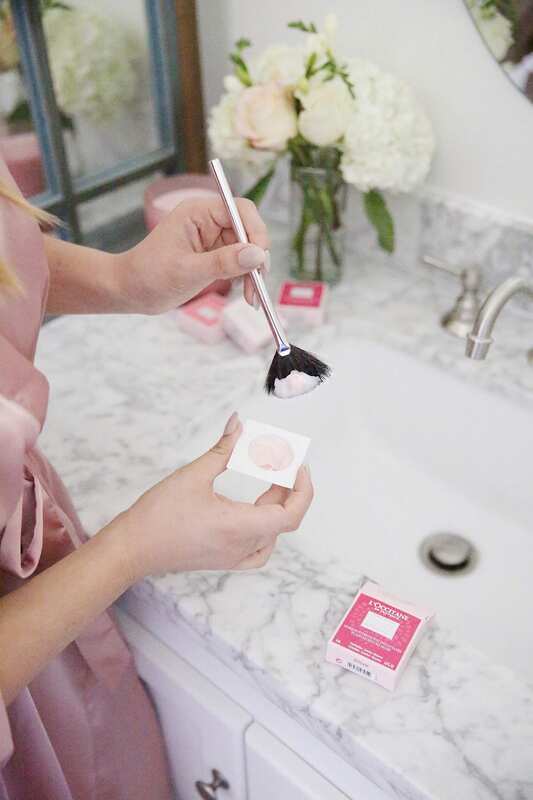 I especially like mini or travel size products because as a beauty blogger I’m constantly trying new things, handing out samples to friends, etc so I like to have smaller versions of products to tote along in my carry on. 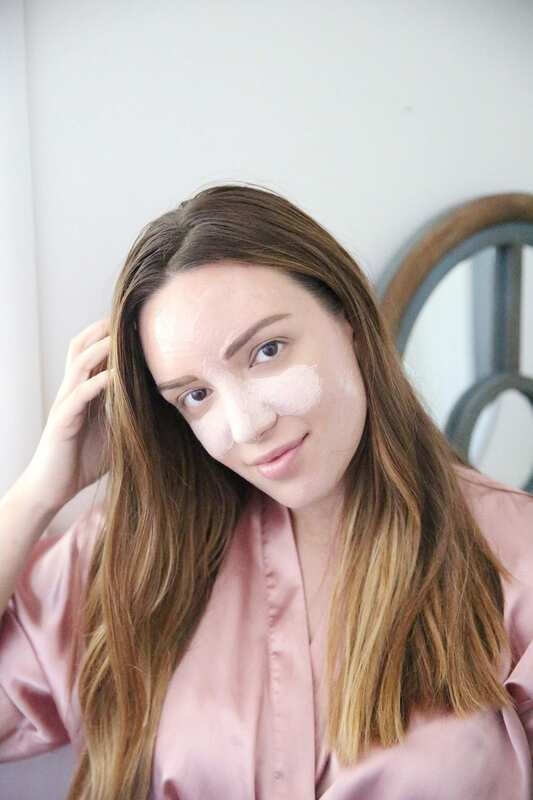 I gave the new L’Occitane Peony Mask Collection a try my for seriously needy skin and loved this ritual to bring my skin back. 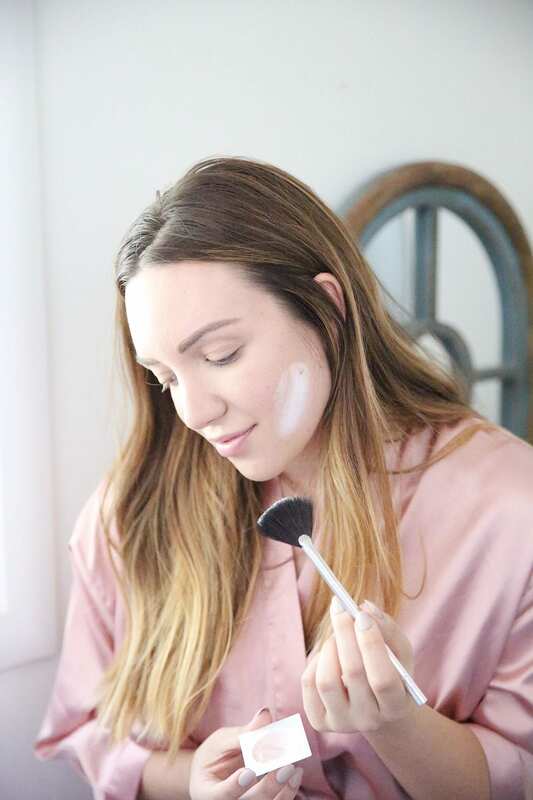 I practice multi-masking at home but I don’t believe I’ve ever covered it on my blog before. Multi-masking is using various types of face masks based on the different needs of our different parts of our face. I generally have larger pores and oil congestion on my nose and cheeks, dryness on my hairline and perimeter of my face, and everywhere else just need a good dose of hydration. I started with the L’Occitane Peony Flask Moisture Mask (these all smell amazing BTW…who doesn’t love the scent of peonies?!) and used a fan brush to apply it to my jaw line and neck for intense moisture that I could instantly feel absorbing into my skin. I think my jaw line needs extra moisture because I can subconsciously rest my chin on my hand when I’m sitting at my laptop for hours on end. 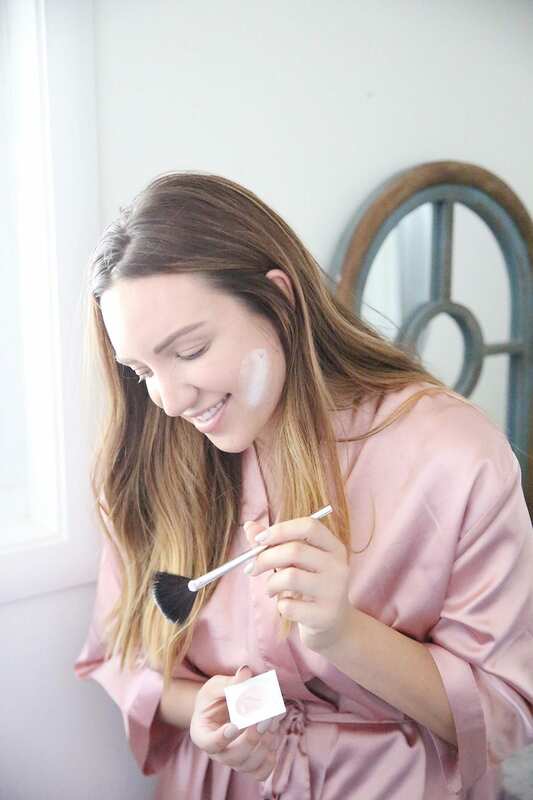 The mask texture is creamy and rich and I love the velvety texture it instantly gives my skin. These types of plumping and hydrating masks are my new favorites! For my next step I grabbed another brush (my favorite way to apply masks, it makes me feel like I’m at a spa!) and opened up the L’Occitane Peony Overnight Perfecting Mask. 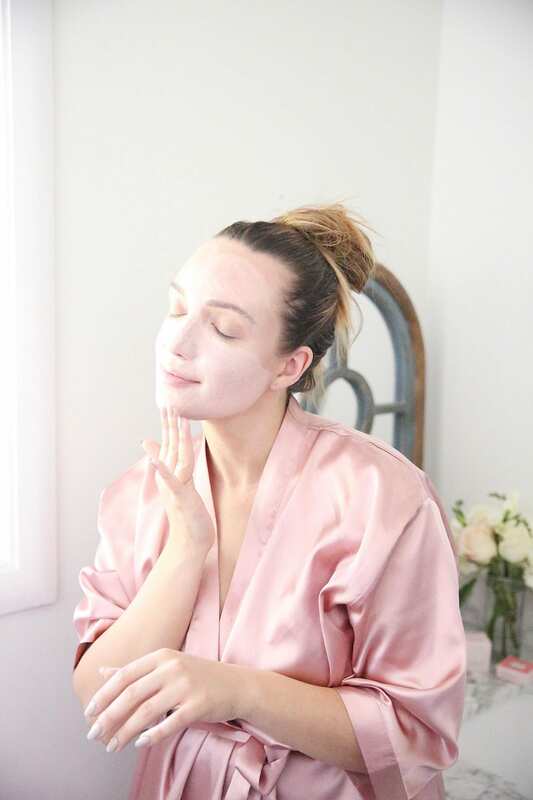 This mask is perfect for applying right before bedtime and letting it absorb into your skin overnight while your skin is most receptive to skincare and self-repair. I knew I wanted to try this overnight mask on my forehead and hairline to help counteract my dryness. The texture is gel-like and hydrating but not oily–so I could get it into my hairline without making my hair greasy, perfect for overnight wear and you can touch up your hair with dry shampoo in the morning. 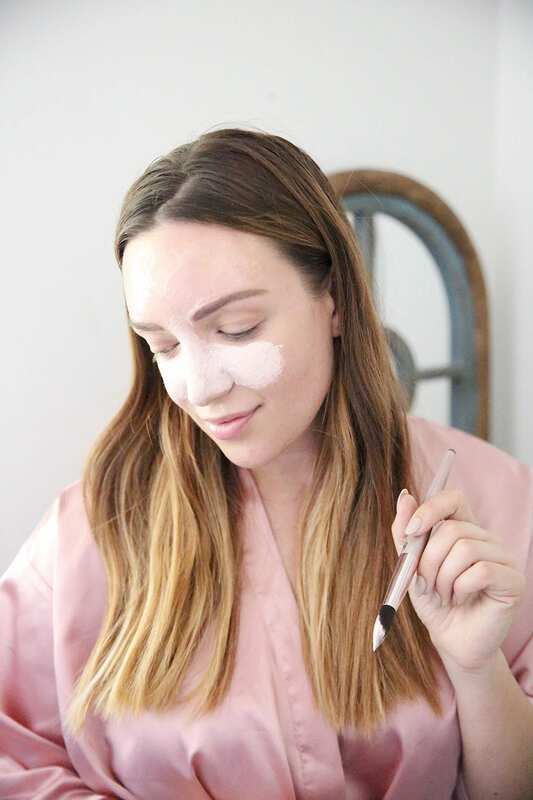 And the last mask I applied you only need to wear for three minutes–I’m going to be saving this one especially for spot treatments when I need to de-slick my skin before makeup application! The L’Occitane Purifying Minute Mask specifically targets the oil shine and larger pores I have on my nose and cheeks to absorb and eliminate impurities. 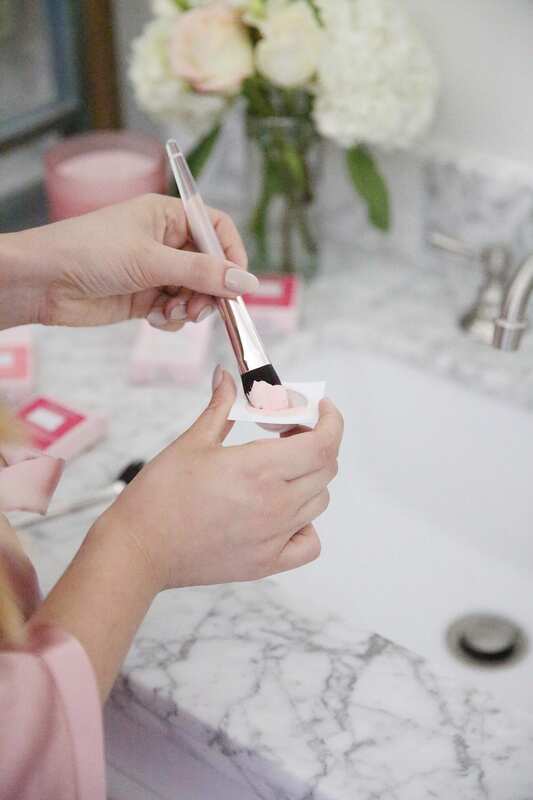 As the mask dries, pores appear smaller (perfect for the perfect no-makeup day) and a more matte appearance. I even had Matt asking to use the remaining purifying mask on his nose and cheeks too! Once I had all of my masks applied, I popped a bottle of sparkling water, turned on a relaxing playlist and caught up on a few pages of a new book that I’m trying out. 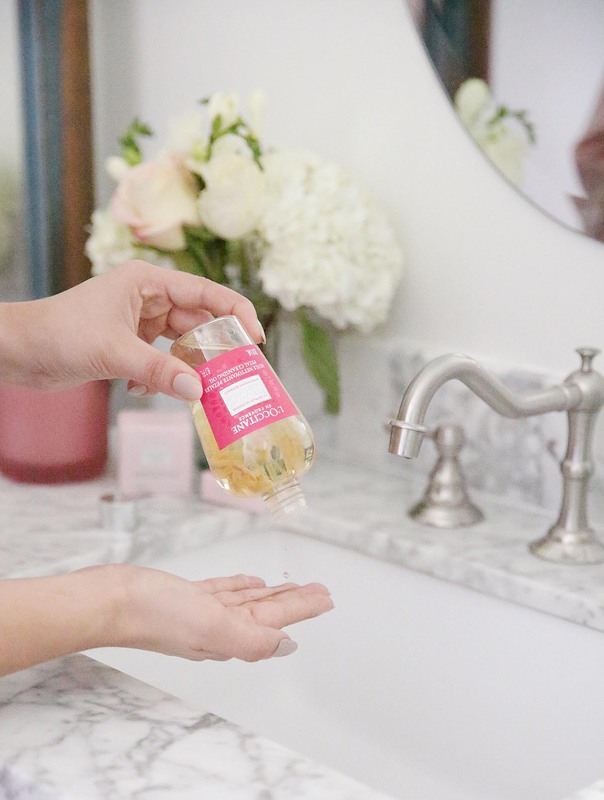 Once I’m ready to remove my masks, I used the L’Occitane Peony Petal Cleansing Oil to remove the masks and also cleanse my skin for one final smoothing and glowing wash of peony. I love the dried peony petals in the bottle–the flowers are from Provence! 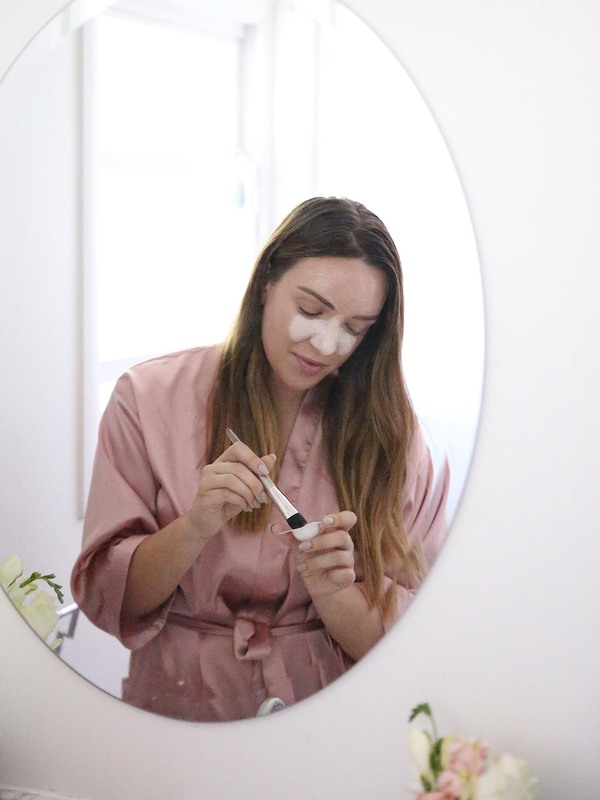 Have you tried multi-masking? I’d love to hear about your experience trying different masks in different areas for your perfectly custom results! Loving this L’Occitane mask feature? 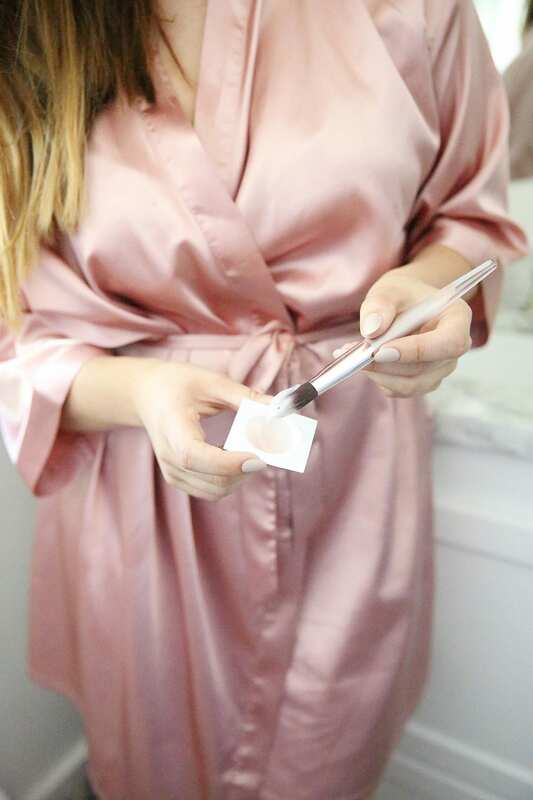 Click here now for more of my beauty favorites! Oh so pretty!! Love all the bright colors and your bathroom. So pretty! Oh wow! I’ll have to give this a try. I’ve actually never tried multi-masking before. It sounds great. I can see this being a really effective way to target specific parts of your face.These masks sound so nice! I must try this mask! I too travel a lot and being exposed to high altitudes, makes my skin so dry. Thanks for the detailed explanation. I never use masks but you have me sold on this one. I have combination skin too so this might be perfect for me. I love your bathroom and bathrobe. L’Occitane is one of my favorite brands and I haven’t tried the mask yet. I’ve been traveling so much that I feel like I can use some pampering. I have never tried multi-maski, but it makes sense. Different parts of your face need different kinds of attention. L’Occitane has great products. My skin is combination also, so I love the idea of a multi-mask! Your bathroom is really pretty too! That is an awesome idea – multi-masking. I also have combination skin so I know this is the best care I can give my skin. I need to get those L’Occitane masks. Thanks for your honest review. That’s really nice! I make sure to take extra focus on my skin too after a vacation. My husband and I travel a lot as well and it’s nice to learn about products that help your skin recover. Wow this is neat! This is the first I’ve seen of any kind of product like this. I think I could really benefit from this one! I need these products in my life, without a doubt. 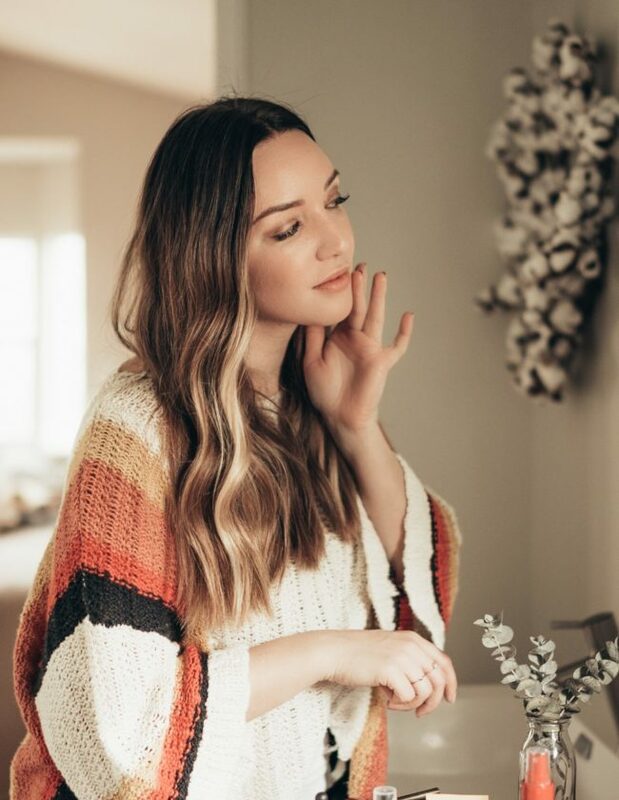 I love spending my me time focusing on myself and taking care of my skin is definitely part of that! I’d love to try these! That is so many flights, girl! Wow! My skin would be feeling it too. Loving the sound of these products! I saw this store at the Palm Beach Gardens mall recently and was so excited. I didn’t know it was a store!! That looks like a great product to try! Would love to try this! I’ve never heard of multi-masking! That’s really interesting and it sounds like it’s the perfect treatment for our skin’s different areas. I like the idea. It is so nice when masks smell good. 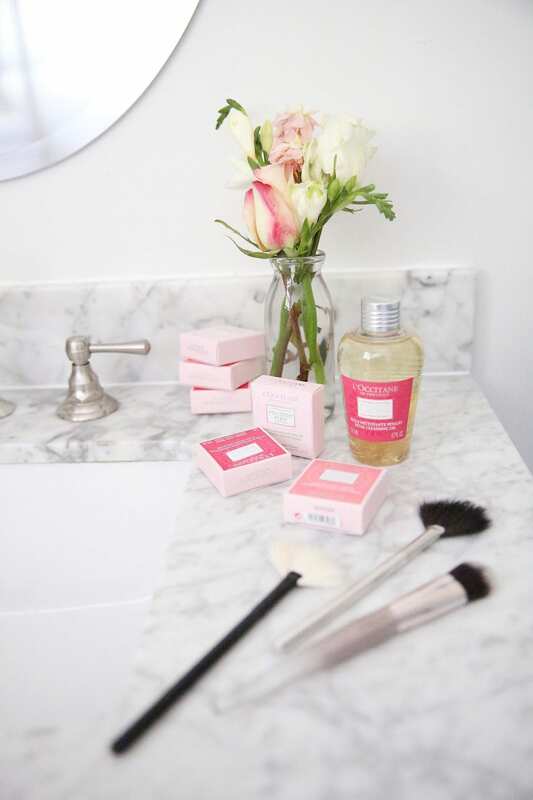 Thanks for sharing that the L’Occitane ones smell like peonies!